The Solar Workgroup of Southwest Virginia is seeking bids for 12 solar projects totalling 2.73 megawatts of energy generation as part of its Commercial-Scale Group Purchase Program. The projects to be developed on businesses, nonprofits and local government properties across Lee, Scott, Tazewell, Washington and Wise counties are part of the Solar Workgroup’s goal to connect building owners and solar companies to develop cost-effective solar projects. 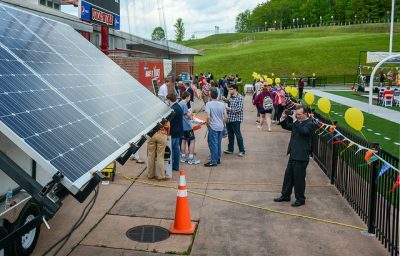 The installations will both help participating building owners save money as well as serve as “ambassador” projects to demonstrate the benefits of the growing solar industry. The request for proposals (RFP) is available for download. “It’s a proven fact that corporations throughout the nation want to be as environmentally responsible as possible, and we here in Virginia’s great Southwest want to make sure that we are doing our best to offer renewable energy to our corporate partners and also to our residents. Producing energy is still important to Southwest Virginia,” said Lou Wallace, member of the Russell County Board of Supervisors and the SolSmart cohort. Proposals are due by May 21. The Solar Workgroup will conduct site visits on April 11-12 and hold a mandatory pre-bid meeting on April 12, which may be attended in person or via webinar. Contact Austin Counts by April 5 at austin@appvoices.org to RSVP for the site visits and to obtain the pre-bid meeting location. Register to attend the pre-bid meeting webinar here. The Solar Workgroup of Southwest Virginia comprises nonprofit and community action agencies, colleges, state agencies, planning district commissions and other interested citizens and businesses seeking to develop a robust renewable energy industry in the seven coalfield counties of Southwest Virginia. The workgroup was co-convened in 2016 by the UVA-Wise Office of Economic Development & Engagement, People Inc., and Appalachian Voices, with facilitation assistance from Dialogue + Design Associates. Additional background information is available at www.swvasolar.org.